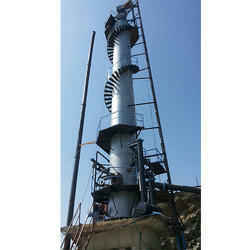 Leading Manufacturer and Exporter of Shaft Kilns such as Lime Verticle Shaft Kiln and Vertical Shaft Kiln from Vadodara. Equipped with external burners and inside special refractory structures, that allow a homogeneous heat distribution in all the kiln cross section. These kilns allow the use of a wide range of fuels, alternate and/or contemporaneously. Thanks to their particular technology, in these kilns it’s also possible to use solid pulverized fuels as pet-coke, coal, saw dust or other waste fuels. We offer turnkey solutions for lime plants including plant engineering, equipment supply, installation and commissioning. We have been serving this industry from 15 years and has provided equipments all around the world. Among lime plants technology, we cater for Hydrated Lime Plants, Quick Lime Plants and Precipitated Calcium Carbonate Plant. We offer lime plants including lime processing plant and lime processing machinery that incorporate the latest technology ensuring efficient functioning optimum output. 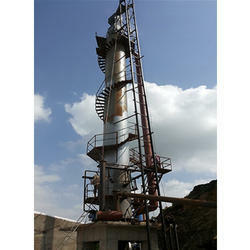 We are also one of the prominent lime plant manufacturers and limekiln manufacturers in India. Single shaft type, high performance and mix fire kiln system from< kinc adds enormous advantages to lime | dolomite industry. Effective and economic way for lime and dolomite calcinations. Customized designs for multiple lower grade ores, ore types. Optimum performance oriented and application specific design.Single shaft type, high performance and mix fire kiln system from kinc adds enormous advantages to lime | dolomite industry. Effective and economic way for lime and dolomite calcinations. In a shaft kiln, the limestone | dolomite moves counter flow to hot gases in the shaft. This gives shaft kilns the lowest fuel consumption of any type of calciner. The shaft refers to a vertical vessel where the calcining takes place. Because of the weight of the bed of material in the shaft, there are limits on the size and strength of the type of limestone that can be calcined. Vertical kilns work on a batch-type system rather than continuous feed, and the upper kiln area is used for preheating. Typically, the kiln would be shut down, the batch would be charged and the burners would be re-fired. The calcined limestone is then removed from the bottom of the kiln through a cooler system at a controlled rate. For more than ten years kinc has maintained sustained edge in thermal processing technologies. We have been supplying a durable line of thermal processing equipment for over decade. Our designs can address a vast array of bulk solid materials and processing requirements. Kinc supplies high temperature, refractory lined kilns for a number of applications and industries. All designs are developed with efficiency, durability and process flexibility over a decade of time period. Looking for Shaft Kilns ?